Don’t think of contractors as commodities. Merriam-Webster defines a commodity as a good or service whose wide availability typically diminishes the importance of factors other than price. Choosing contractors solely based on price significantly increases the chance of problems developing during the project and long after the project is complete. It is very important to examine all of the different qualities of a contractor so you can choose the one that will provide the most value to you and your company. Don’t assume all contractors have the same level of expertise and qualifications. Do you have a process to gauge the level of expertise and qualifications of the contractors that you are considering? Some contractors are more capable of fixing your problems than others, and hiring the wrong one may lead to further issues rather than a solution. You might incur more expensive repair costs in the future because the contractor did not adequately fix the problem or their repair did not last as long as you expected. Your tenants might complain about disruption because the contractor is not experienced in working in certain buildings. Research your potential contractors’ expertise and qualifications by asking them questions and checking their company’s website. What buildings that are similar to yours have they worked on? What problems that are similar to yours have they solved? What do their customers say about them? 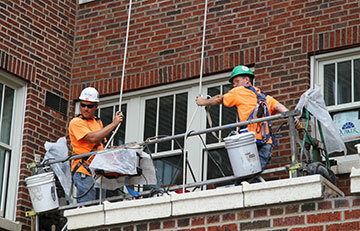 Can they solve all of your building’s problems or will you have to hire multiple contractors? Ask them for the names and numbers of their past clients, and then talk to those persons about their experiences with the contractor. There are many ways to determine a contractor’s expertise and qualifications, and doing so can save you a lot of money, time and headaches. Don’t think all contractors offer the same level of dependability. Will your contractor honor their warranty? Will they be in business for the duration of the warranty? Will they come back to make repairs if necessary? People lose money all too often because they hire undependable contractors. Make sure you choose a contractor that has been in business for a long time and has the longevity to be there for you over the years. Also be sure to choose a contractor that won’t run away from problems. Most of all make sure that you and your company receive the protection and security you deserve. Don’t accept reactive communication plans. How, when, and why will your contractor communicate with you? What information will they provide you with and when will they give it to you over the course of the project? Do they have a plan? Will you have to track them down when you need something? Is the project on schedule? How is tenant disruption being kept to a minimum? You need to have all the information about the project at your fingertips so you can effectively communicate with your colleagues and tenants. You shouldn’t have to call the contractor for answers; you should already be in the know. Don’t ignore contractors’ reputations. Which contractors do your colleagues use? Who has the contractor worked for in your industry? What do people say about their company? A contractor should provide you with case studies, testimonials, and references that confirm their quality and value. If you want the truth about a contractor, read their testimonials, call their references and talk to people who have used them in the past. Don’t treat all possible solutions the same. When you receive proposals from multiple contractors, they are not identical solutions. There are factors like price, tenant affects, safety, materials, and schedule to consider. Make sure you understand these and how they impact you and your company. One proposal may be more expensive than another, but the quality of the work might help you avoid future repair costs. It is important to be aware that value comes from many areas, not just price. Work with your contractor to understand the differences in your options so you can make the best decision for you and your company.